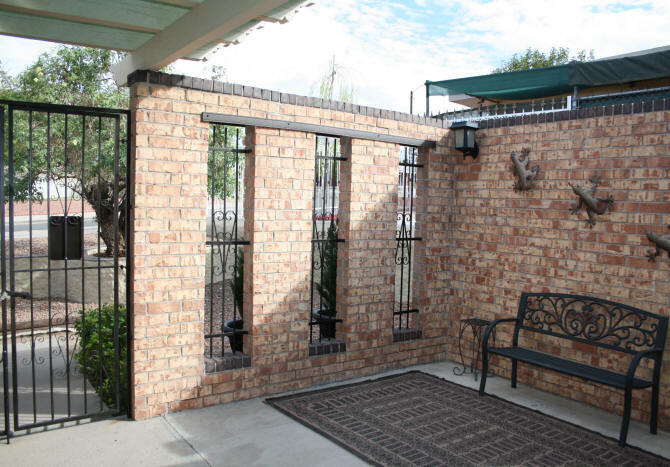 This year I wanted to accent the brick wall that encloses our front entrance patio. I wanted to give this section, at the front of the house, a little more street appeal. 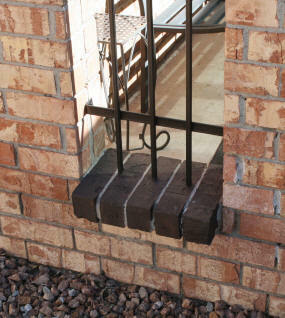 The plan is to apply a darker colored paint to the top row of bricks and the bricks on the wall window sills. Above the windows on the wall, I plan to place a simple piece of decorative moulding painted the same color as the bricks. 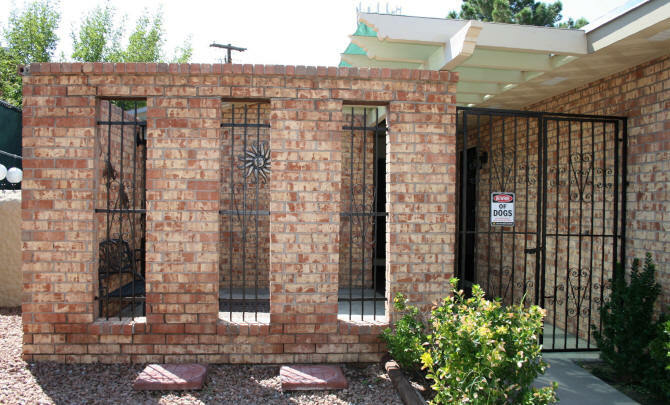 I wanted the painted brick to look as if a darker colored brick was used to build the wall. NOT like the bricks were painted. This will be done by painting only the bricks and not the mortar. A darker brown will be painted on the bricks first. 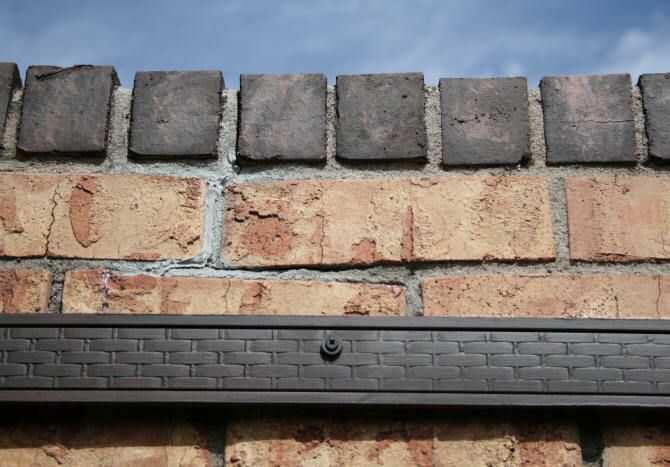 Lighter colors that match the existing bricks will be dabbed on the darker color to give the darker color a more realistic brick look. Since we moved into our house in 1998, there have been two bricks missing from the front patio brick wall. For the most part, these missing bricks were not really noticeable. See photo above. This is now the perfect time to replace these bricks. Since I am going to paint these areas, what I use to replace the brick does not matter, because it will be painted anyways. I thought of replacing the brick with brick. Hey, what a concept! 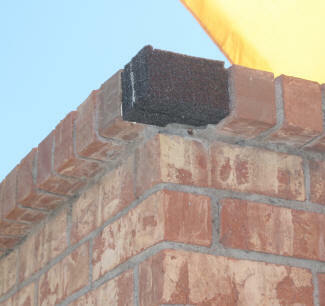 Then I though of trying to mortar these bricks that basically have no support underneath them. Notice how they both hang in mid-air. How do you get something heavy to stick properly and stay there without any support underneath? 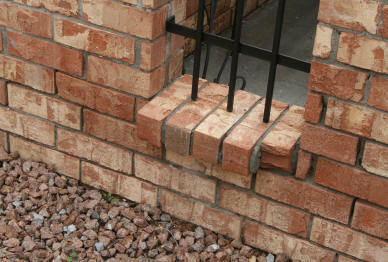 I then came up with the idea of using something other than brick to replace the missing and broken bricks. Since both of these bricks are not supporting the wall I could use a much lighter material and make fake bricks to fill the areas. When painted, you would not be able to notice that they were repaired. I used packing material. 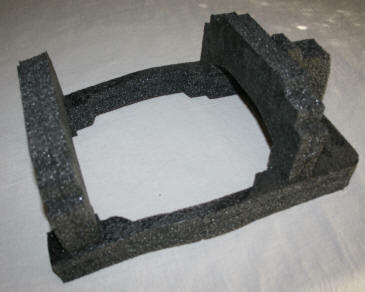 The type of cushiony foam that is used to pack computers and other electronics in boxes. Unlike styrofoam, this material does not crumble apart. Believe it or not, I save this packing foam when I get it. 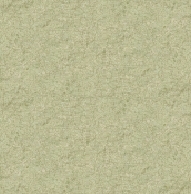 It works as a raised painting surface, as insulation, as padding, etc. To cut it easily, use a serrated kitchen knife. I needed to cut several pieces and then glue them together to get the size I needed for my "bricks". I dry fitted the faux bricks in place and cut out areas on the backside to fit around the existing mortar. I then used construction adhesive to glue them in place. 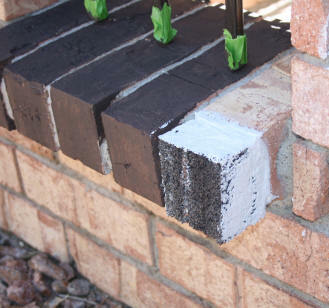 After the glue had set, I smeared some elastomeric caulk on them to smooth them out like the existing bricks. Then they were painted the dark brown color of the painted bricks. Both the top row of bricks were painted on both sides of the patio. The top of the bricks were also painted, even though you can not see them from ground level. Top row of bricks and window sills painted first color of paint. Some caulking done between some cracks with missing mortar. Will be painted darker gray later. September 28, 2016 -- I needed to buy some moulding and paint it, so over a week has passed. There was no hurry to finish this project. 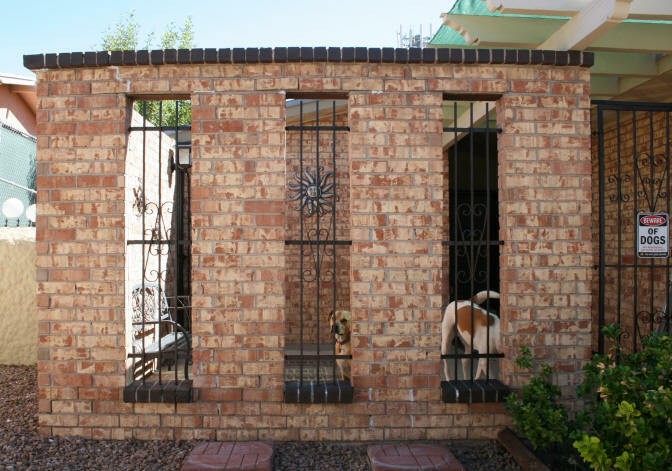 I went over the dark brown paint, that I had painted onto the top row of bricks and the window sills, with some orange paint that matches the dark color of the bricks. I dabbed and smeared it on randomly with a sea sponge. The darker bricks now have a more weathered natural look to them. See photos below. 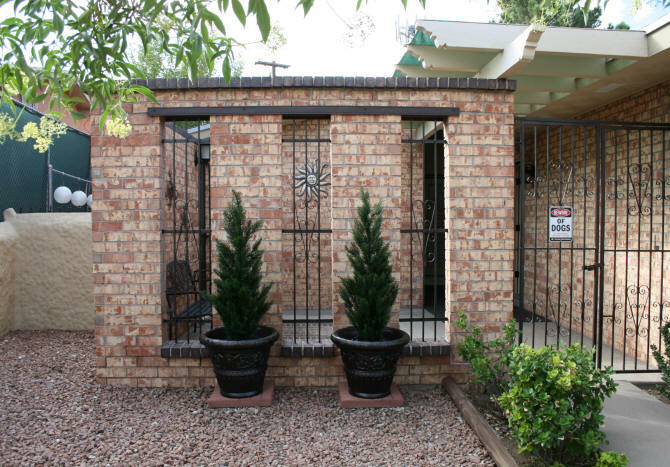 I wanted to place some kind of moulding over the windows on the front patio brick wall. I originally thought of placing a single piece of trim over each window.... but I looked more closely at the wall. What I noticed was some mortar failure along the row of bricks right above the windows. There is metal along this row of bricks providing support. I decided instead to place one long piece of moulding along the top of the windows to cover this loose mortar area. However, I removed loose mortar and the previous visible patching in this area and repaired, before placing the moulding on. I was not sure what type of moulding to use. I first thought of some lightweight polystyrene moulding but I thought it might snap and break placing it over the uneven surface. I saw some decking material that would be durable but it was too heavy. I settled on some pine decorative moulding with a basket weave pattern. The wood moulding was first painted on both sides with an exterior primer. 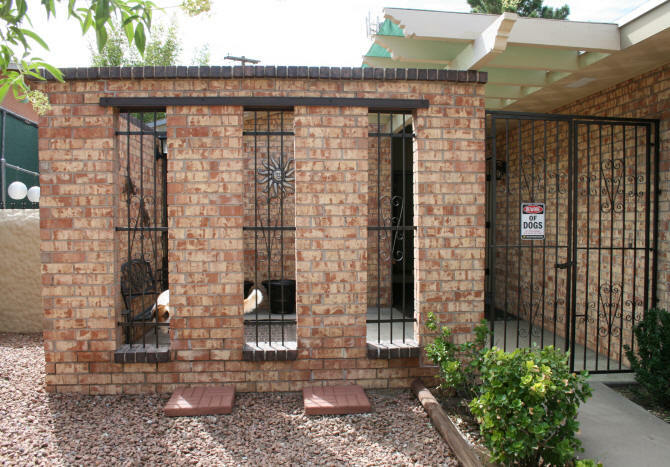 I then painted both sides with the dark orange color of the bricks. 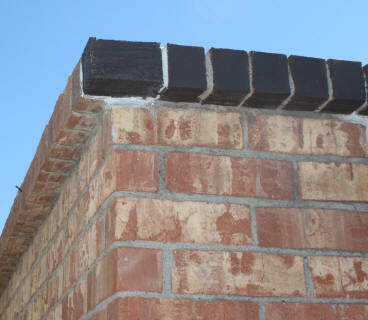 I then placed a light coat of the same dark brown I used on the bricks. 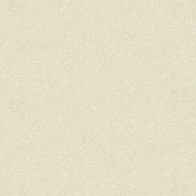 While the moulding looks brown as seen below, there are some orange undertones. 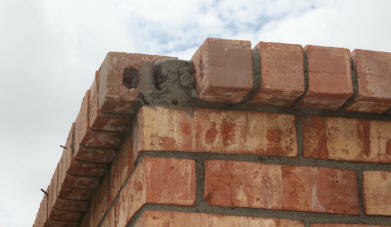 The moulding was placed on the brick using Tapcon concrete screws after drilling holes in the brick with my hammer drill. The screws were screwed in manually. I placed a rubber washer between the head of the screw and moulding. The rubber washer was used to 1) provide some cushioning, 2) prevent the screw head from digging it's way into the moulding over time, and 3) to keep water out of the screw hole. The screw heads and washers were then painted brown. Along the top edge of the moulding, I placed clear caulk. This way when it rains, very little water will seep in behind the moulding. No caulk was placed on the bottom edge of the moulding. This will allow for drainage in case water does get behind the moulding. Another item that needed attention were the two cement pavers that are used under planters. We used to have two large wood planters that rotted away. White hard water residue stained the top of the cement. The fastest way to fix this, was to paint the cement. This took me a quick 15 minutes to do. The end result of this project is subtle. Chances are my neighbors cannot even tell I did anything. To me, the darker paint on the brick wall gives the wall more depth. The wall before I painted it, looked flat....ho hum. 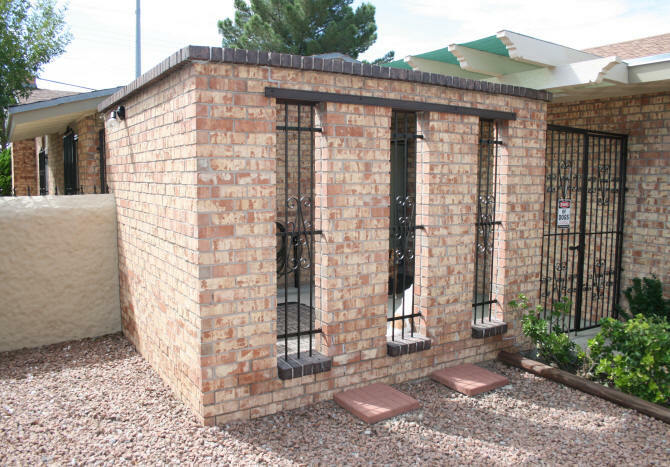 You hardly noticed that the top row of bricks and the window sill had overhanging bricks. Now the wall has more depth and is a little more interesting. After photo showing painted brick, moulding above windows, and touch-ups.